An axis is defined as the imaginary line around which a body rotates – so for example the Earth’s axis is an imaginary line through the centre of the globe between the North and South Poles around which the Earth turns every 24 hours, providing us conveniently with day and night. Situated almost exactly on the border of where the City becomes the West End, and in an imposing position at the corner of Aldwych and Wellington Streets, it is easy to imagine London revolving around Axis, a restaurant in the luxury One Aldwych Hotel. Although hotel guests can enter Axis via the hotel, there is a beautiful street entrance to the restaurant at the apex of the elegant granite Edwardian building, from where you descend a rather grand spiral staircase to the basement level restaurant. Opened together with the hotel itself in 1988, Axis serves modern British cuisine and is currently in the safe hands of Executive Chef Dominic Teague who aims to combine respect for British tradition with gentle invention. He is committed to careful sourcing and his menu includes an array of foraged foods – all of which sounded very promising. Therestaurant space itself is surprisingly not full of dark corners nor claustrophobic, despite its basement location, largely thanks to high ceilings, careful lighting and well-spaced tables. The wine list is comprehensive, but rather than commit ourselves to a single bottle of wine to try and match all our menu choices, we placed our trust in restaurant manager Deborah Morris (co-incidentally also a South African) to provide a glass of matching wine for each dish. While we had a look at the menu, we had some excellent bread (apple and poppyseed; and olive rolls) served with butter and a little copper pot of excellent hummus. After much debate, Nick chose to start with the Colchester crab with avocado, radish, norinade and topped with a brown crab fritter (£12.50). This arrived looking as pretty as a picture, a lovely delicate dish that made good use of the succulent crab meat. Nick particularly liked the idea of the crab fritter, and the Thelema Sauvignon Blanc that was served with it was a good match, never overpowering the delicate flavour of the shellfish. 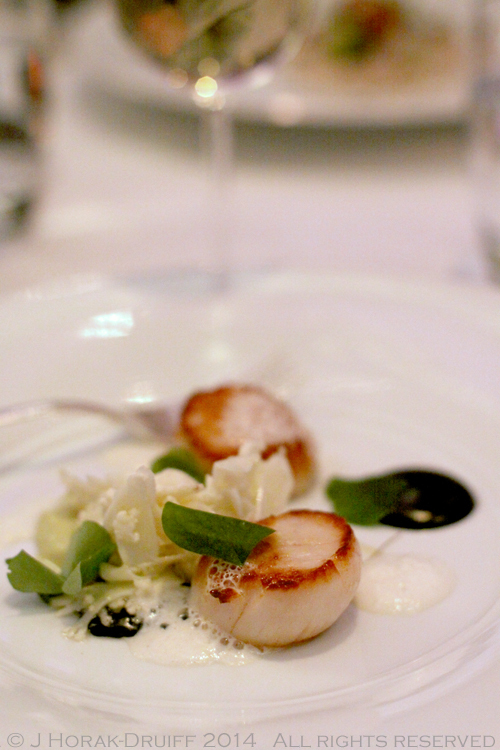 I chose the diver scallops with textures of cauliflower, fennel, squid ink emulsion and crisp rice (£16.00). Compared to the lengthy menu description, the plate looked quite restrained, but in terms of flavour and texture there was a lot happening. The crisply seared scallops were joined by both a rich cauliflower puree, a foam, and crunchy raw mini-florets which added crunch together with the crisped rice, while the squid in emulsion added both a colour contrast and an umami punch. This very successful dish was paired with a glass of Domaine d’Elise Petit Chablis and its lemony minerality proved to be a very successful match with the rich flavours of the dish. For his main course, Nick could not resist the Organic Angus black beef sirloin & cheek with English onions, roasted carrots, spelt and watercress (£24.50). I love dishes with a particular meat done two ways and this one did not disappoint. The sirloin was beautifully crimson with a seared crust, and the beef cheek had been slow-cooked to fork-apart tenderness. The little carrots added sweetness while the watercress puree added a lovely tartness. These flavours matched up well with the accessible fruits and supple tannins of a glass of Argentine Santa Ana Malbec. 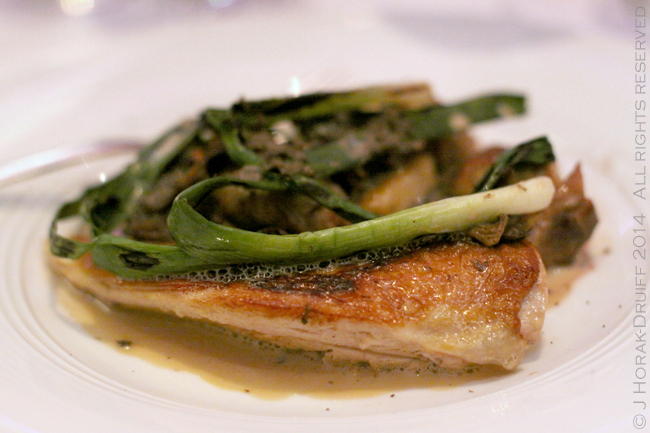 I opted for roasted Guinea fowl with a sauternes sauce, yellow chanterelles, truffles, gnocchi and grilled leeks (£19.50). Any menu envy that I may have had for Nick’s beef dissipated as soon as I tasted this. The guinea fowl (always surprisingly not very gamey) was moist but with a crispy golden skin and the combination or sauternes, chanterelles and truffles made for a decadent but never overpowering sauce. The matching wine for this dish was a glass of Yering Station Pinot Noir, a surprisingly full bodied pinot noir with flavours of cherry and vanilla. We also had sides of spinach and mashed potatoes (£4,00 each), also served in the covetable little copper pots. Although there was a tempting selection of desserts, I can never resist a cheese board and so I selected the plate of British and continental cheeses with preserves and honey (£11.00). This consisted of three cheeses supplied by La Fromagerie which I sadly did not note the names of, but included a beautifully soft goat’s cheese and two other hard cheeses, together with a homemade chutney and a drizzle of honey. 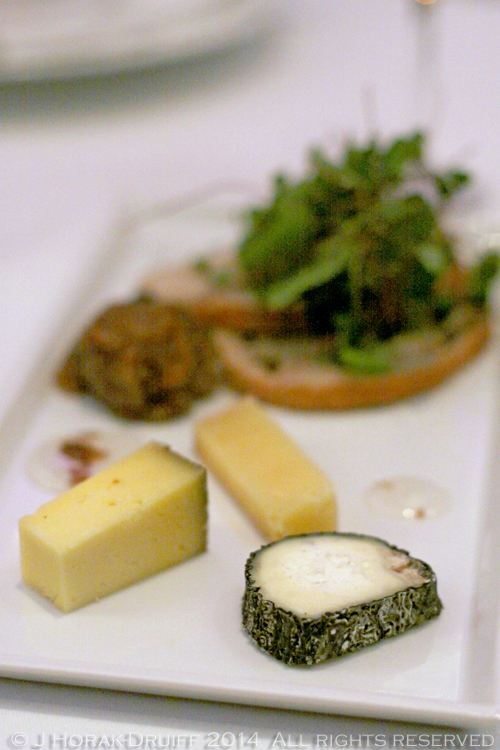 My only niggle would be that for £11, three small pieces of cheese is a little meagre, however good the cheese. Nick is not a cheese fan and so he chose the Cambridge crème brulée with Earl grey syrup, Yorkshire rhubarb and blood orange (£7.00). Why Cambridge, you ask? Because apparently despite the French claiming ownership of this classic dessert, it was on the menu at university colleges in Cambridge a good 60 years before the French first published it. Nick’s was pronounced deliciously creamy and topped with the crimson tartness of rhubarb and blood orange. To round off our meal and match our desserts, Deborah chose some Canadian Peller Estates Vidal ice wine which was real treat: deep golden colour and flavours of marmalade, dried peaches and apricots. A fabulous way to end any meal. We lingered until quite late over coffee and petit fours, chatting to Deborah who was a fount of vinous knowledge, before the short trip upstairs to our room. 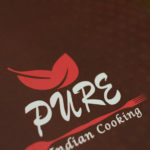 The meal overall had been most enjoyable, both in terms of the relaxed ambience of the restaurant and the solid cooking. There is nothing on the menu that would scare the horses but ingredients were obviously carefully sourced and everything was very well executed and attractively plated. The prices, although not terribly cheap, are perfectly reasonable given the quality of the food and the prime London location. 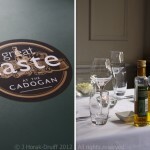 The restaurant serves dinner Tuesday to Saturday; brunch on Saturday and Sunday; and a good value pre- or post-theatre menu Tuesday to Saturday 17h30-18h30 (2 courses for £20 or 3 course for £25). If you are planning to go for a meal, do make sure you leave time beforehand to enjoy drinks in the hotel’s Lobby Bar, both for the excellent cocktails and the classically beautiful room. DISCLOSURE: I enjoyed this meal as a guest of One Aldwych Hotel. I received no further remuneration to write this post and was not required to write a positive review. All opinions are my own and I retained full editorial control. What pretty food. This menu does appeal to me – especially the creme brulee with rhubarb. What a treat to have ice wine. I love Axis. Have been there many times now for lots of different occasions but my favourite was the movie night deal. We thought the meal would be pants but it was really lovely quality. In my early years in London, I used to love meeting friends for dinner at one of a small set of my favourite places that did great value pre-theatre menus, which made higher quality food affordable to me. Axis was one of the places I used to go to a fair bit, and I took visiting friends from overseas there too, when they came. Haven’t been for so many years now!! !